This is one for bundle developers – it allows you to use the ⌃⌘T “Select Bundle Item…” mechanism inside of the bundle editor. Selecting an item will expand the item view and select the corresponding item, and focus the relevant editor field. It also extends the search to show languages too. Someone on the TextMate mailing list asked if there was a way to have the project outline show Finder colour labels, so here’s a plug-in to do just that. where 0.2 is the opacity you want (0 - 1: 0 is fully transparent, 1 is solid). 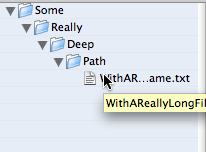 Here’s a plug-in for TextMate which indicates the Subversion status of files in your project drawer. Download it here. Simply extract and double click the SVNMate.tmplugin to install it into TextMate (you’ll need to restart TextMate for it to load). Update: There is a problem with this plug-in right now and I forgot to remove the download link, apologies to anyone who’s been trying to get it work. In short, the problem is that it requires the Subversion libraries, but they can’t always be found. I’m trying to get them linked statically with the plug-in instead (so that the libraries are included). I’ll post an update or an alternate fix soon. Update: After much blood, sweat and tears I’ve finally got a statically linked Universal build. I hope The download link above is back up, and is the new version. If you experience any problems with the new build (or if you don’t! ), drop me a comment below. Well I finally got around to doing some fixes to my input manager for glyphs today and I thought this would be a good enough reason to finally start a blog, so here it is. This input manager makes it easy to quickly insert glyphs for any keystroke. You can get the input manager here. Move the DefaultKeyBinding.dict inside the folder to ~/Library/KeyBindings (Note: if you already have a DefaultKeyBinding.dict then you will need to merge the contents of the two instead). This update improves glyph selection and disables global hotkeys (such as QuickSilver and ⌘⇥). Note: be sure to follow these instructions if you are on Leopard.